Use fabric to decorate your home this winter! Don’t let the name fool you! While we are well-known for our wide selection of paints and painting products at Columbia Paint, we also proudly provide fabrics for your home decor needs. From new curtains to soft home accents, we have what you need to make your house feel a little more like a home with the right decor. As you shop for your next home decor project this winter, consider these three excellent fabric brands offered by Columbia paint for your next home design project this year. Soften up the look of your living space with a variety of soft tones and patterns offered by Thibaut fabrics. From wovens to sheers, Thibaut fabric is sure to be a high-quality addition of soft style to your home in 2018. Add some light to the look of your home fabrics just in time for the holidays with Thibaut fabrics in your living room this year. For a rich look of deep colors and textures in your home fabrics, turn to Kasmir fabrics offered at Columbia paint. Particularly for homes with lighter paint choices and bright colored decor, the darker accents of Kasmir fabrics may be a perfect complement to the look of your home interior. 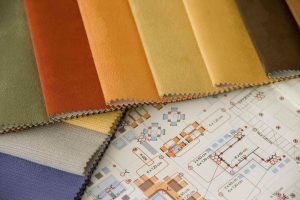 In addition to their beautiful look in a home, Kasmir fabrics are also available for commercial use, meeting high abrasion and flame retardancy standards for commercial spaces. If you are looking for eye-catching brights with a beautiful finish, look no further than the fabrics of RMCoco for your next home decor project. Brighten up the look of your space with clean and polished looking fabrics that will create a stylish yet comfortable look in your home. With beautiful details, the fabrics of RMCoco could be a great addition to a simple look in your living space. As you browse for your new fabrics, you can see photo galleries for each line on our website listed below each fabric brand. With the right online resources and personalized help from the professionals at Columbia Paint, you can turn your home into your perfect indoor space just in time for holiday entertaining!